Egypt's President Abdel-Fattah El-Sisi has affirmed during a meeting in Cairo on Tuesday with Norway's Foreign Minister Ine Eriksen Søreide his country's commitment to the two-state solution to the Israeli-Palestinian conflict. El-Sisi discussed with the Norwegian foreign minister various developments in the Middle East. The Egyptian president stressed his country's support for the Arab Peace Initiative and international legitimacy resolutions, as well as efforts to resume the peace process. The two sides exchanged views on the latest developments in the Palestinian issue in light of Norway's historical role in negotiations between the Palestinian and Israeli sides, which led to the 1993 Oslo Agreement on the urgent necessity of reviving the negotiation process. 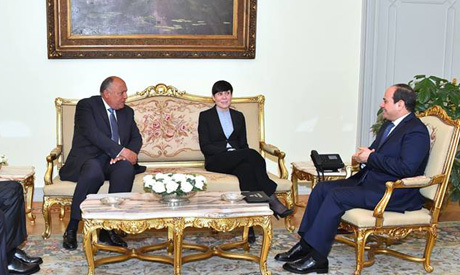 The Norwegian foreign minister hailed the role played by Egypt in this regard and Cairo's efforts to restore stability and contain the repercussions of crises in the region.